Rolf Feltscher’s header led to the Galaxy goal. (Photo by Duane Barker). 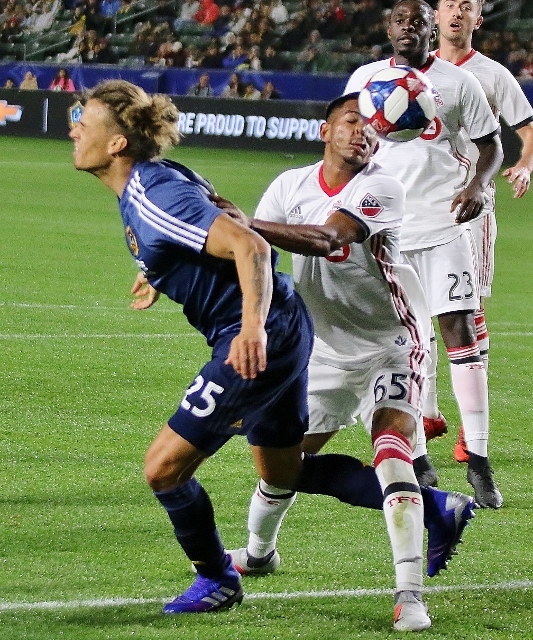 (Carson) – The Galaxy gave up an own goal in the 87th minute that allowed Toronto FC to salvage a 1-1 tie in a friendly match Saturday night at Dignity Health Sports Park. The Galaxy went up 1-0 on another own goal by Toronto’s Terique Mohammed in the 55th minute and it appeared that would hold up and be enough for the win. But in the 87th, a ball deflected off of LA defenseman Dave Romney and scooted past goalkeeper David Bingham and into the back of the net to even things up. The Galaxy had a couple of chances in the first half but were unable to cash in. 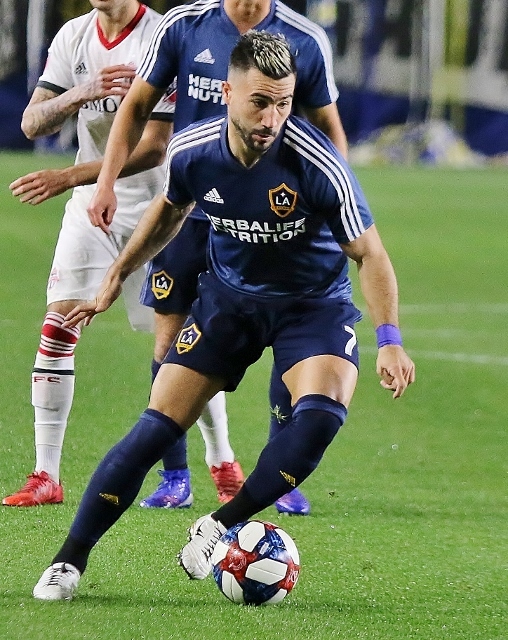 Romain Alessandrini’s blast at the 18:46 mark of the first half was saved by Toronto’s Alex Bono. Alessandrini had another shot in the 30th minute but his boot sailed high over the crossbar. Bono made another stop on an attempt by the Galaxy in the 40th minute. Toronto’s Lauren Cimon was hit with a yellow card for a foul on Chris Pontius in the 42nd minute. Neither team could push anything across and the teams went into the half in a scoreless tie. Early in the second half Uriel Antuna made a nice move down the left side and found Alessandrini with a cross but he couldn’t convert in the 53rd minute. Romain Alessandrini was on the attack early for the Galaxy. (Photo by Duane Barker). The Galaxy finally broke through in the 55th minute when Rolf Feltscher scored on header from the left side of the net. Upon further review Feltscher’s shot deflected off of the face of Toronto’s Terique Mohammed and was ruled an own goal. Toronto FC nearly tied it three minutes later but a header in front failed. The Galaxy made wholesale changes in the second half including fan favorite Emmanuel Boateng who entered the game in the 71st minute. Juninho came on in the 75th. They appeared to be cruising to the victory when Toronto FC tied it with the own goal with three minutes left. The Galaxy played the first preseason match of the year without Zlatan Ibrahimovic (precautionary), Ola Kamara (illness), and Giovani dos Santos and Sebastian Lletget who had muscle injuries. Next up for the Galaxy is another friendly home match next Saturday night against Vancouver at Orange County Great Park.